A feature of the Painting Stirling exhibition at the Stirling Smith is the work of the eminent American – British artist, Mary Louise Coulouris (1939 – 2011). She trained at the Chelsea and Slade Schools of Art in London, and in the Ecole des Beaux – Arts and Atelier 17 in Paris. From 1976 she lived in Linlithgow, and her work for the Smith was undertaken as an Artist in Residence for six months in 1984 – 1985. Most artists visiting Stirling were attracted by the beauties of the landscape, but Mary Louise’s interest was in the cityscape and in the people. 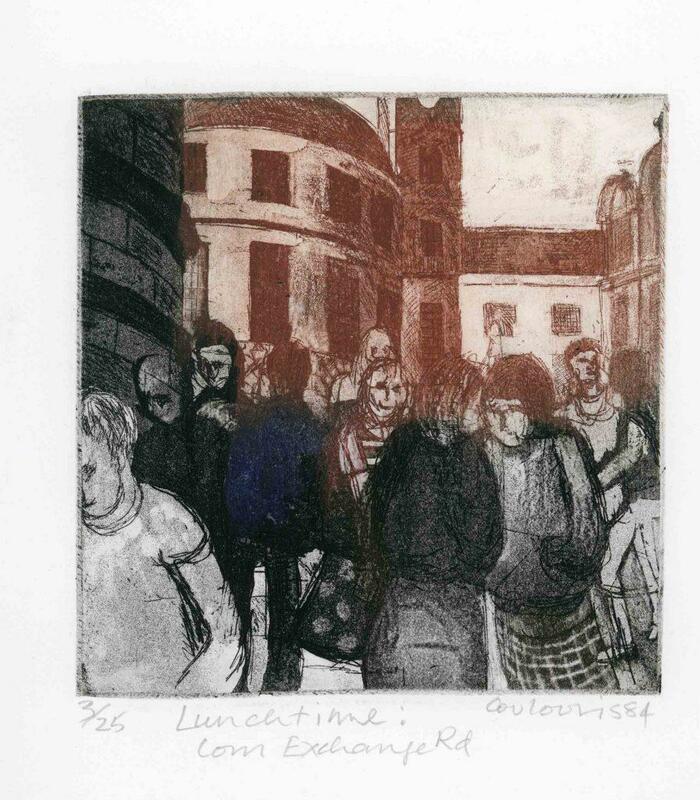 The production of this work, ‘Lunch time in the Corn Exchange’ is shown through all of its stages from the initial sketch to the finished print. Among the other subjects she tackled were scenes at Stirling Station, the Bowling Green, and the Stirling Smith. Other public commissions which followed included murals at the Linlithgow railway station (1985), and the Royal Edinburgh Hospital (1990); a rug design for the Scottish Poetry Library (1999); tapestries for Yale College, Wrexham (2002); a series of watercolours for the House of Lords (2004), and a set of watercolours inspired by poetry for the Royal Free Hospital (2008). The Smith exhibition runs to 29 October.